Does this sound like a familiar lead conversion business story? After working tirelessly to attract visitors to your site with inbound marketing strategies your lead conversion process is still not making you money. The phone isn’t ringing, people aren’t buying your products or services, and you are getting more frustrated by the minute. If your site is already receiving a healthy amount of traffic (check with Google Analytics), but you aren’t converting that traffic into leads, there is little to no point trying to generate more visitors. Our statistics reveal that most businesses lose 95% of their potential sales by not optimising their lead conversion process. If you are unhappy with your lead conversion rate, this blog aims to give you 5 tips that will improve your conversion process, stop the frustration and help you convert more sales. Lead conversion is that very special moment when a website visitor takes the desired action on your site. How do you get a relative stranger who visits your site to convert to a marketing qualified lead (MQL) and then a sales qualified lead (SQL)? Tip: Lead conversion is not as simple as it used to be! Just like raising children, growing older, and life in general – things are getting more complicated! Digital technology and human behaviour change so quickly that even if your business has a playbook for converting leads, as marketers, we have to be continually learning and updating our playbook to keep up with advancements. 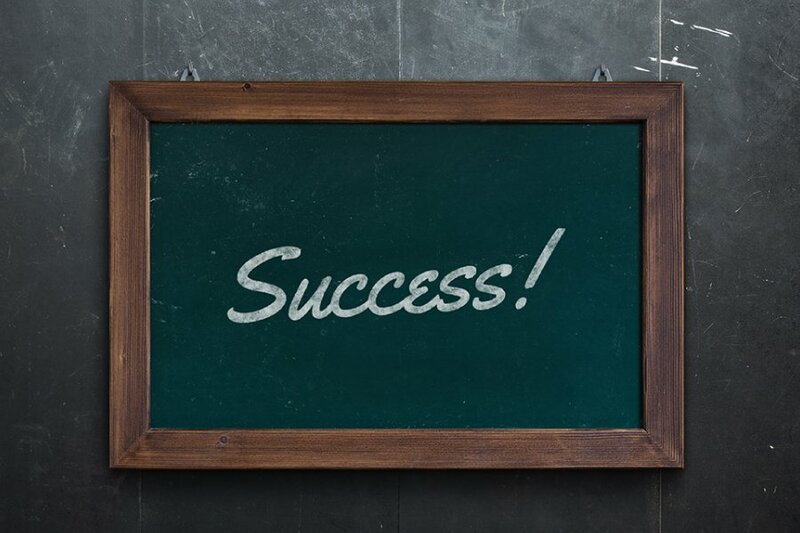 So while your old lead conversion strategy may still have success, there are good reasons why you should learn how to optimise this process. The key, to lead conversion, is to provide an experience that results in movement through the buyer’s journey from awareness, to consideration to decision making. Lead Conversion takes visitors and turns them into leads that you can nurture through the buyer’s journey. These visitors then become Marketing Qualified Leads or MQL. A marketing qualified lead is a lead that has come to your site looking for an answer to a problem or challenge. 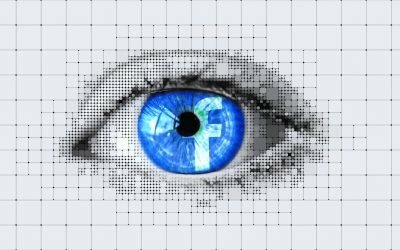 Through analysis of the pages visited and content consumed you can market to these visitors using a strategic approach that offers further valuable content. At a certain point, the analytics behind the marketing activity will determine if a lead is ready to become a sales qualified lead and ready for deal closure. A strong integration between your sales and marketing activities allows for a seamless flow for your target audience. For potential customers, this makes the process of going from a stranger to converted much smoother. Lead conversion will improve if you consider and map out a series of steps that take your visitors through the various stages of the buyer’s journey. Where each stage of the buyer’s journey requires a different level of content offer. A content offer is a great way to draw visitors to your site without being too aggressive. The content that you create should appeal to your target audience. The content offer should be something that helps them solve a problem or challenge they are facing. Today’s buyers have more choice of information sources than ever before, so your content offer should add value by solving their problems in an easy to digest manner. It is the content offer that will attract visitors to your website and compel them to take action. The type of content that you create will depend on the visitor’s stage in the buyer’s journey, so create content with that journey in mind. Are you creating content for visitors in the awareness, consideration or decision stage of the buyer’s journey? Each content offer should appeal to the audience you are targeting. Ideally, the content should be of such perceived value that the visitor would gladly pay for it. The more valuable the content offer, the more likely a visitor will be to give you their details. Collecting these details is crucial to inbound marketing. It is the way you can nurture your new lead through the buyer’s journey. A call to action message is any element on your website or blog that prompts a visitor to take action. Call To Action messages are more effective when they contain an action word that tells the visitors exactly what to do. Words like “click”, “download” and “request” give a visitor a direct instruction and lead to more action taking place. Include a Call To Action message on every page of your site and at the end of every piece of content that you create. A popup call to action message can be activated on any page of your website. 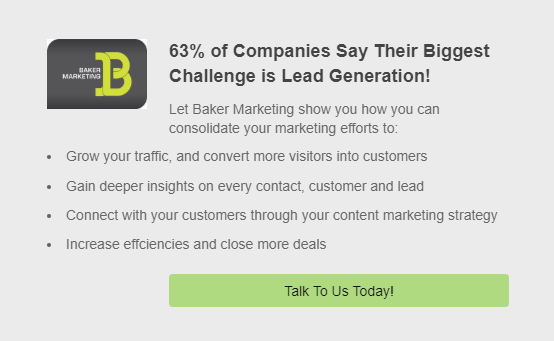 The above pop-up message for Baker Marketing appears on our Homepage. It targets visitors who are ready to make a decision, and prompts them to book a consultation. 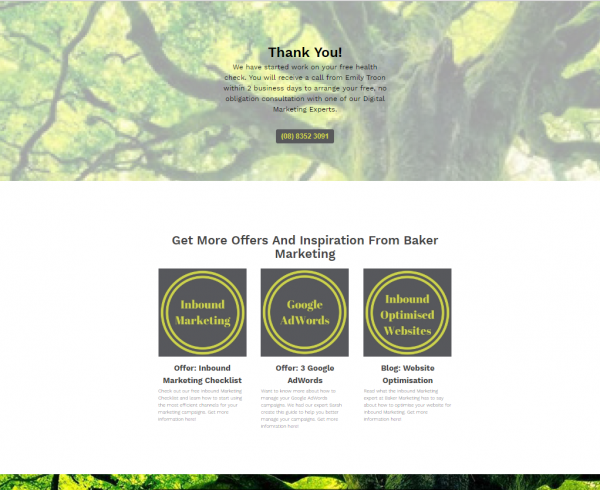 The offer is to allow Baker Marketing to help generate leads for your business. Similarly, this popup is used on other relevant pages of our site. 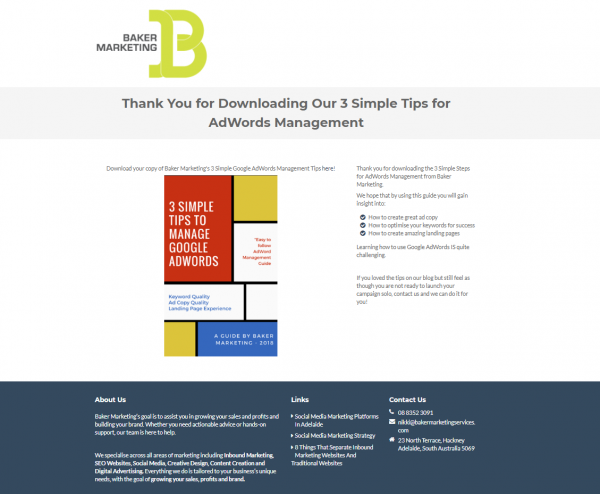 The pop-up gives visitors an opportunity to convert by offering a free tip sheet on how to better manage Google AdWords campaigns. This is an awareness stage content offer and is designed to attract a variety of potential customers who are still in the research phase of problem-solving. 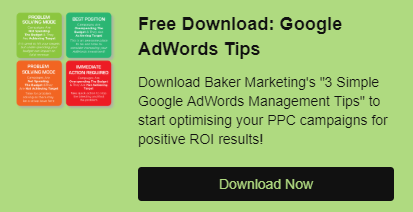 If a visitor converts on this pop-up, marketing automation takes over the lead nurturing process and sends further information relating to Google AdWords until the buyer is ready to make a decision about seeking outsourced assistance, or they opt out of the process. Outlined below are four different call to action buttons that you can use on your site to promote lead conversion. Request A Call Back Button: This button call to action allows visitors to your site to request a call back from a member of your team. 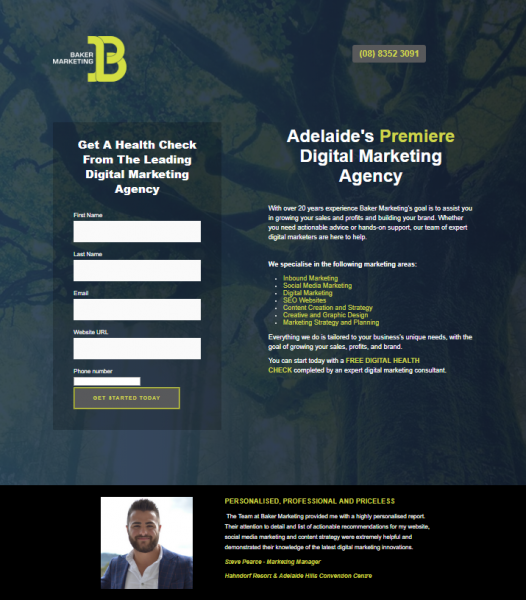 They are taken to a landing page with a form where they enter their details and within one business day, they are connected with a digital marketing expert. Phone Number call to action button: Anyone who clicks on this CTA can call our office through Facetime (on a desktop) or using their mobile device. It is a quick an efficient way to connect with the right audience when they are looking to connect. Download the Free Buyer Persona Guide Button: This call to action, found at the end of a blog outlining the importance of buyer personas, offers a guide to creating buyer personas. This call to action button shows how you can make your buttons as visually appealing as you want. Download the complete inbound marketing guide button: Again, another example of a button that links with a content offer. This one is simple in design, but, is still effective due to the use of actionable words such as “Download” and the relevance of the content offer to the page it is placed on. Chat boxes can be integrated into your website or used through social media. A chat box humanises your business and gives visitors a real person that they can talk to. It is the kind of call to action that can speed up the buyer’s journey significantly if your business can offer a solution to a problem or challenge immediately. By simply including social sharing icons as a call to action on your website you are actively asking visitors to share information that they think is valuable and helpful to their tribe of followers on social media. 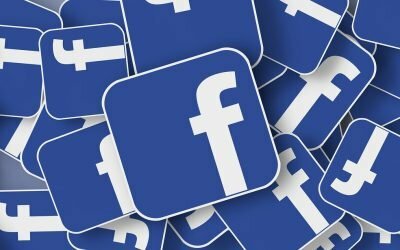 Social sharing icons are a great way to increase brand awareness and drive more traffic to your site that you then have the opportunity to convert. These are all examples of the different types of call to action messages that you can include in your lead conversion and inbound marketing strategy. But if you really want to create a powerful call to action message on your site then having the ability and technology to make them smart will allow you to really optimise your lead conversion process. A call to action message will give you more opportunity to convert visitors when you make it clear what you want them to do. There is so much you can achieve with a great call to action message, especially when you use technology that makes them smart. The idea of a call to action message is to give a visitor or lead specific instructions on what they should do next. Making them smart allows your call to actions to be relevant to every visitor that comes to your site. Smart call to action messages offers visitors further valuable material as they move through the buyer’s journey. Having a smart call to action message simply means that it is targeted and specific to the person who is visiting your site. For example, if a visitor has already converted on our Inbound Marketing Checklist call to action message, the next time they visit the page they would see a different call to action message. The CTA for a second visit promotes conversion through a Case Study of a business using the checklist. This change in the call to action message that appears on our page signifies that a lead is moving through the buyer’s journey. The first call to action offers a tip sheet which is targeted to the awareness stage of the buyer’s journey. The smart call to action message that appears on the same page, after a visitor has already been converted to a lead, is targeted to the second stage in the buyer’s journey, the consideration stage. 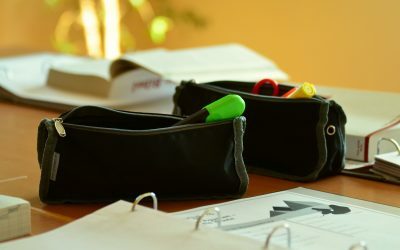 A case study is a great consideration piece of content because your lead has already identified the problem they are facing, found someone (you) who offers information on how to solve the problem (in the form of a checklist) and are ready to digest more information on your specific way of solving the issue. Having these smart call to action messages on your site is an automated and buyer-centric way to move visitors and leads through the buyer’s journey and closer to the end goal of lead conversion, which is the decision or sale stage. The call to action message kicks off the conversion path. A conversion path is a process in which an anonymous visitor becomes a known lead. However, for them to become a known lead, they need to give you their information. This is typically done through a form that you place on a landing page. You want to collect information on a visitor (and convert them into a lead) after they have clicked on a relevant call to action message to download or receive a content offer. As you can see from the example below, we have created a clean page with no distractions. The page outlines the content offer and uses a form to collect information on the lead to allow us to nurture them through the buyer’s journey. A thank you page is the place where your new lead will land once they have completed the form on the landing page. It’s also the place where the content offer can be downloaded. A thank you page should look and feel similar to the landing page where your visitor just came from with a few exceptions. After a new lead has navigated away from your thank you page, an automated email should follow. Perhaps it is time to stop thinking of your website as a static resource that is decaying in Google as we speak, and start thinking of it as a dynamic resource full of information that your target audience, visitors and leads will want to interact with. It is the use of inbound marketing strategies highlighted above that move visitors through the buyer’s journey and convert them into customers for your business. If you want to increase your lead conversion efficiencies then having a website that is optimised for inbound marketing is an essential element in this process. Check out our blog on Inbound Marketing Websites here. If you would like more information on how you can implement an inbound marketing lead conversion strategy on your website give Baker Marketing a call today on (08) 8352 3091. We have an inbound marketing expert available to help you right now! Alternatively, you can use our call to action message below and request a call back from a team member. Thank you pages are very important for tracking conversions in GA too.